For the month of March, the City of Santa Clarita has an exhibit on the First Floor Gallery of City Hall called "Seascapes to Seashores". This exhibit is presented as an extension of the Santa Clarita Public Library reading program of the book In the Heart of the Sea by Nathaniel Phillbrick. If you are in the area, check out the many talented artists that have art in the exhibit. I am so excited to see my image Antarctic Sunset printed on metal for the first time. Below is a photo of me standing next to the 12 x 18 metal image. If you are interested in having this image of an Antarctic sunset in your home, you can order it here. Thanks to fellow exhibitor and Antarctic traveler Joel Bareng for taking this photo. The exhibit ends March 31, 2015. Last weekend, Two Elephants in Granada Hills hosted An Evening of Art & Wine featuring my photography in one central location. Needless to say, this was a really exciting event for me, and I was so happy to see so many people that have been supportive of my work in one place. I was completely overwhelmed with gratitude for the supporters that were there and the fact that I got to share my photography with so many. Seeing my images as prints, all in one central location, was really special. There is something about making an image that is special, and then to be able to hold physically hold it is pretty amazing. Being able to share those in person was a great feeling, as was when people started purchasing them to bring them home with them. I have been at photography for quite a few years now. I am still learning, as we all are, and there have been so many of you that have been along with me from the very beginning of this journey. Thank you to everyone who has come along with me on this journey at any phase - stick with me, I feel we have a long road to travel. Thank you to all who came out to the event last Saturday! It has been a long time since I have posted--I have had some personal health obstacles within the past 10 months, and am finally getting back to blogging! I have some exciting news to share with my wonderful readers, I have recently gained interest in having my images hanging in a few different locations. Currently, I have six images hanging at a spa in Santa Clarita, CA-- what is more calming than some beautiful macro nature images? Of course you can contact me about ordering any of these images for the walls of your home of to give to someone you love! Oh my gosh. I get that being an artist takes courage. Really, I do. You get out of your box to create art. And then that art that you created while out of the box that you think is kind of cool is put out for all of the world to see. Gulp! 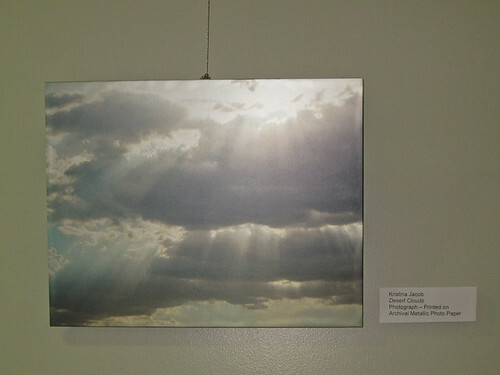 In my case, I am currently exhibiting a photo in the City of Santa Clarita City Hall First Floor Gallery Exhibit. This is the ultimate collision of my private life of photography and my work life of, well, making maps for a local government. People I work with on a daily basis walk by my image (whether they know it or not). It’s nerve racking to put my art out there for people I actually know, not some strangers that just see an image and a name. Double gulp! But it is rewarding when someone sees my name next to my piece and says, “I know her!”. Last night was a reception for the exhibiting artists to meet and greet their flocks of admirers and mingle with each other. It was really nice for me as an employee and exhibiting artist to participate in the evening because I was able to chat with other artists and colleagues that I rarely get a chance to talk to. I hope to attend more events that exhibit my work, even though it stresses the nerves out a bit. This month’s exhibit of clouds should have a a couple of more weeks to go, if you are in the area please take a moment to stop by and check out some cool art. Thank you to the City of Santa Clarita Arts & Events office for creating a display of public art and having a really great reception! Each month, a new theme is exhibited, and this month just happened to be clouds (right up my alley!) It's very exciting to see my art work on the wall, and I'm grateful to everyone who has taken a few moments to stop and appreciate it. If you are in or around Santa Clarita and have a chance, stop by to check out the Gallery, there are some really cool pieces in the exhibit this month. Thank you to the City of Santa Clarita for creating the Art in Public Places Program!